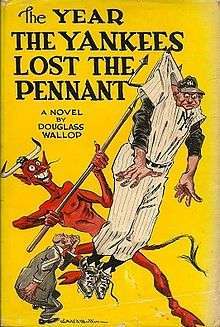 The Year the Yankees Lost the Pennant is a 1954 novel by Douglass Wallop. It adapts the Faust theme to the world of American baseball in the 1950s. The transformation takes place, Hardy joins the Senators, and all begins to develop as "Applegate" had predicted. However, the new baseball superstar begins to realize that his deal with "Applegate" may not be so temporary and he may have let himself in for more than he had expected to get. As Hardy's doubts grow over his predicament, "Applegate" presents Hardy with love interest Lola, depicted as a glamorous temptress in the style of the 1950s. ↑ "Recommended Reading," F&SF, April 1955, pp.82. To Hell with the Kaiser!